← A belated Royal Wedding post . . . 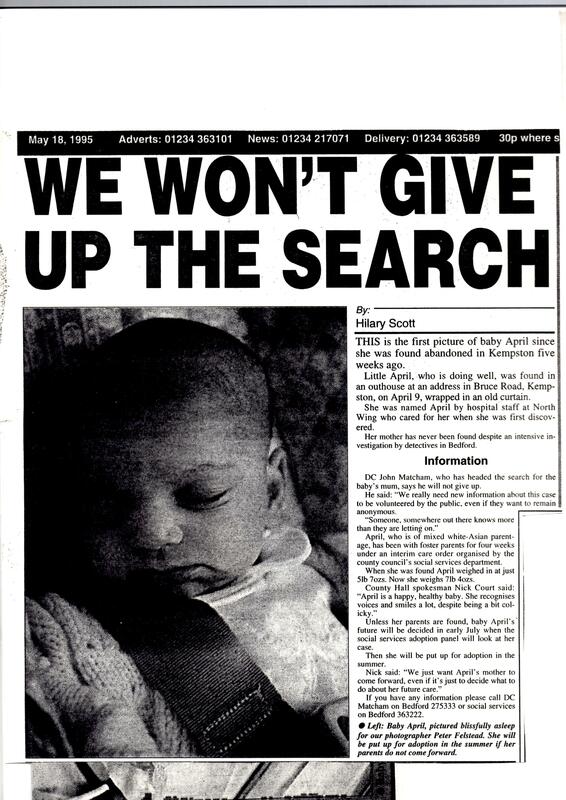 I thought I remembered this case – an abandoned baby in Bedfordshire named April. I was around 11-13 yrs old when I saw it on the news and I’m 41 now but have never forgotten. So the dates don’t tie in; but what a coincidence. I recall the baby was left in a semi rural area and found by a WPC who was driving, it said the policewoman never normally covered the route so the baby was lucky. I googled the case and have found nothing except your article, which is so interesting to read. Thanks for your kind comments. I wrote that piece six years ago so she’s 22 now. I know she was adopted into a family who adored her and I hope one day she might get in touch to tell her story.